Though looking every bit his eighty-six years of age as, whisp-haired and hunched over, he shuffled slowly across the stage to the venue's sustained applause, once Pierre Boulez opened his mouth to answer a question from his interviewer Pierre-Laurent Aimard, the lucidity of his well-crafted phrases showed a mind still crystalline and an intellect still in the bloom of health. Although now in his twilight years, Pierre Boulez has lost little of the acuteness that made his name. This festival of Boulez's music, Exquisite Labyrinth, was the brainchild of Pierre-Laurent Aimard, an advocate of much too often-unheard late twentieth century music and a figure increasingly present in the British music scene. It made for a fitting celebration of the Frenchman's music, a timely reappraisal in which we got a good overview of Boulez's work as a composer. The public interview came before Saturday night's concert at the Queen Elisabeth Hall. It was clear the esteem in which Aimard holds Boulez, who is an unimpeachable figure in France, and though the conversation ranged over a number of topics – the role of space in Boulez's conception of polyphony, the theme of death running through his compositions, the influence of his conducting on his composition – the tone was a bit dry. It didn't matter much of course, since most in the audience were happy just to be present at an event with a genuine touch of history. And once the music began, Clio Gould opening things with Anthèmes 2 for solo violin and electronics, it mattered even less. Anthèmes 2 is a relatively recent piece, premiered in 1997 at the Donaueschingen Festival. Over its twenty minutes it sees the violinist journey through various contrasting, electronically-augmented textures: synthetic pizzicato bursts surround the audience in the venue's speakers; strange metallic resonances twin slowly-bowed double stops; and eventually the febrile discourse winds down, dissipating into a haze of lush harmonic clouds. It was a virtuso performance from Gould, unlikely to be bettered. Two sound technicians from IRCAM in Paris were at the sound desk, guiding the realisation of the live electronics, which had that trademark IRCAM sound. 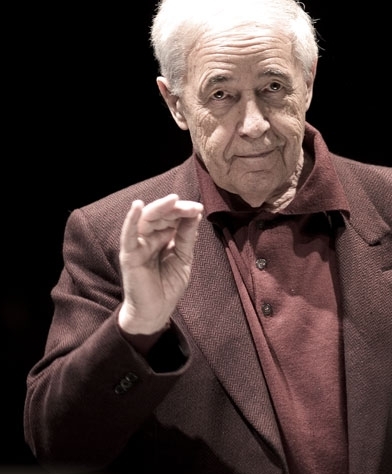 Boulez has recently said: ‘I do have one [regret]: the time I have spent conducting. That is why, if I am healthy enough, I will now devote my time to composing.’ Thus Anthèmes 3, this time a violin concerto, is currently in process. And if rumour is to be believed, Boulez is also at work on his first opera, supposedly a version of Waiting for Godot – though this reviewer respectfully wishes the rumour to be a false one. …explosante-fixe… came after the interval. Scored for flute and live electronics, two flutes, and orchestra, it was originally composed in 1971 in memory of the recently deceased Stravinsky. During the earlier interview Boulez mentioned how conducting Wagner was instructive with regards how Wagner in later years reworked material that had first come to him much earlier on; and a lot of Boulez's own compositional work has similarly seen him revisiting material older in provenance, with this rewrite of …explosante-fixe… dating from the early 90s. The music came in a deluge, crashing onstage as from a burst dam. Here was the Boulezian 'organised delirium' par excellance, unceasing for thirty-five minutes and never getting tired. A frenzy where so many things are happening at once, and at such breakneck speed, that it's hard to keep tabs on what's happening, …explosante-fixe… was here excellently dispatched by the London Sinfonietta conducted by Peter Eötvös. No doubt about it, it seemed, this is difficult music – to listen to, to perform, to conduct. Michael Cox was an excellent soloist, though it was sometimes hard to hear him for the raging ensemble. In kitsch modernist-futuristic style, he and the two other flautists, Helen Keen and Rebecca Larsen, each of them taking up a different apex of a triangle around the stage, wore headpieces with wires running down from their ears, looking slightly cyborg while keeping in touch with what was going on. One of the thrills was watching this play of identity between the three flutes, a dislocated subject at the heart of the piece. The electronic part was never overbearing, smattered here and there like CGI in a Hollywood movie. On Friday evening the Royal Academy of Music Manson Ensemble opened the weekend, performing three works to a full house at the QEH. In the first half of the concert the early-1960s work Domaines was performed twice, first the version for solo clarinet, dynamic and fascinating, and then the version for clarinet and orchestra, flat and interminable. For the solo Domaines the stage was set in darkness apart from spotlights which successively lit up each of the several music stands strewn about the stage, Rozeen Le Trionnaire walking from each to each. This theatrical aspect of the piece really lent to the music, an atonal, tremolo-heavy prose monologue in the manner of Beckett. Despite a good, jocular reading from soloist Elaine Ruby and the other scattered players, and despite the presence of Susanna Mälkki at the helm (Boulez's successor as conductor of Ensemble Intercontemporain), the faults of this piece were all too apparent. An over-intellectualism prevails that denies anything in the way of dynamism, let alone a much-craved tutti from the combined instrumental forces, and the piece is also much too long. Rituel in memoriam Bruno Maderna followed, Boulez's only major work from the seventies, written before the advent of IRCAM and at a point where his compositional inspiration was drying up. Despite again some obvious faults the piece was entertaining, a timbral tapestry of mini-gestures with a pinch of French orientalism.